[[underline]]MOVIES[[end underline "Salt of the Earth" (1959) Will be showing in the Iowa Memorial Union at the Bijou on... Wednesday, Feb. 20 at 7:00 p.m. Thursday, Feb. 21 at 9:00 p.m. This film is the most important and successful feature produced by American leftists in the 1950's. Herbert Biberman, a producer and screenwriter who was named as one of the Hollywood Unfriendly Ten during the witch-hunt of the '50's, directed this film on location in New Mexico. Unable to work in Hollywood, Biberman and his blacklisted colleagues independently produced this semi-documentary re-creation of an actual year-long strike of Mexican-American zinc miners. "Salt of the Earth" is the only American film with the magnificent Mexican actress Rosaura Revueltas and co-stars Juan Cacon and Will Geer. (94 min.) B&W * * * * * * * * "Blood of the Condor" Will be showing in 301 Lindquist Center for Measurement, sponsored by the Society for International Development... Tuesday, Feb. 19 at 7:30 p.m. This Bolivian film by Jorge Sanjines was named the best 1970 San Francisco International film at the Festival and won the 1969 George Sadoul prize as the "Best Foreign Film" of the year. Mr. Sanjines was named "Best Director" at the 1969 Venice Film Festival. One of the most controversial and highly acclaimed films ever produced in Latin America, [[underline]]Blood of the Condor[[end underline]] is a dramatized account - based on actual events which occurred in Bolivia in 1968 - of a U.S. imposed population control program administered by the 'Progress Corps' (read Peace Corps) which sterilizes Quechua Indian women without their knowledge or consent. Most important, however, the film's portrayal of the events - and the violence which ensues - provides accurate reflection of the predominant attitudes of Latin American's towards U.S. "aid" programs. 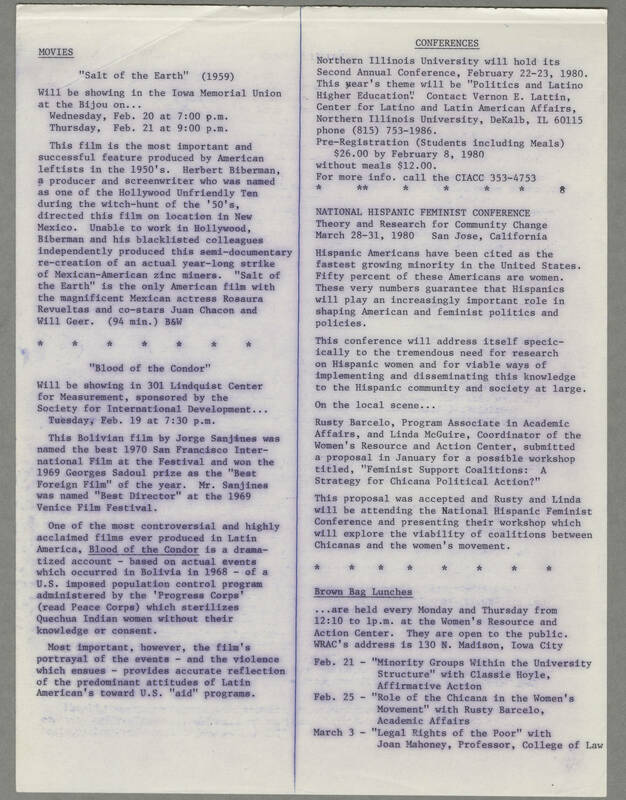 [[underline]]CONFERENCES[[end underline]] Northern Illinois University will hold its Second Annual Conference, February 22-23, 1980. This year's theme will be "Politics and Latino Higher Education." Contact Vernon E. Lattin, Center for Latino and Latin American Affairs, Northern Illinois University, DeKalb, IL 60115 phone (815) 753-1986. * ** * * * * * NATIONAL HISPANIC FEMINIST CONFERENCE Theory and Research for Community Change March 28-31, 1980 San Jose, California Hispanic Americans have been cited as the fastest growing minority in the United States. Fifty percent of these Americans are women. These very numbers guarantee that Hispanics will play an increasingly important role in shaping American and feminist politics and policies. This conference will address itself specicically to the tremendous need for research on Hispanic women and for viable ways of implementing and disseminating this knowledge to the Hispanic community and society at large. On the local scene... Rusty Barcelo, Program Associate in Academic Affairs, and Linda McGuire, Coordinator of the Women's Resource Action Center, submitted a proposal in January for a possible workshop titled, "Feminist Support Coalitions: A Strategy for Chicana Political Action?" This proposal was accepted and rusty and Linda will be attending the National Hispanic Feminist Conference and presenting their workshop which will explore the viability of coalitions between Chicanas and the women's movement. * * * * * * * * [[underline]]Bown Bag Lunches[[end underline]] ...are held every Monday and Thursday from 12:10 to 1p.m. at the Women's Resource ad Action Center. They are open to the public. WRAC's address is 130 N. Madison, Iowa City Feb. 21 - "Minority Groups Within the University Structure" with Classie Hoyle, Affirmative Action Feb. 25 - "Role of the Chicana in the Women's Movement" with Rusty Barcelo, Academic Affairs March 3 - "Legal Rights of the Poor" with Joan Mahoney, Professor, College of Law.